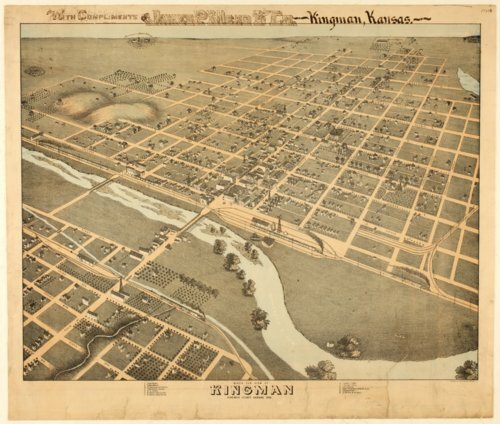 This bird's eye view of Kingman, Kansas, was drawn by Augustus Koch. It shows the court house, a school, churches, the Kingman Planing Mill, the Kingman Opera house, two newspaper offices, a fair grounds, and two railroad depots. One railroad line was the Wichita & Western Railroad and the other was the D. M. & A. R. R. (Denver, Memphis and Atlantic Railroad.) The street names are on the image and the location of the business district is very obvious. Individual houses are also visible. There are several windmills in the image. The south fork of the Ninnescah River runs through Kingman. Hand printed in the upper margin is the phrase With Compliments of James P. Mead & Co., Kingman, Kansas. Mead's property is in the upper left area of the image.